The designs for the coasters can be found under the Christmas 2004 design collection. 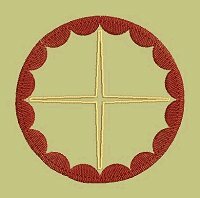 The round designs above are coasters out of felt fabric made in the hoop. They fit onto the foot of your wineglass and are available in 2 sizes. 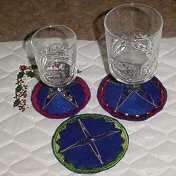 You can also embelish the coasters with crystals or beads. Make different color coasters and decorate each coaster differently so no drinks will be swapped at the party. 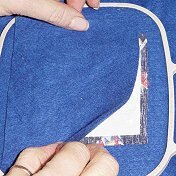 With these coasters you will be sure that no stains will be left on your furniture because the coaster will stay on the foot of the wineglass. Below are some photos to show you how it is done. 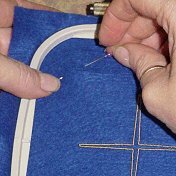 You will need: felt, stabilizer and a piece of fabric. Step 1: Hoop one layer of felt. 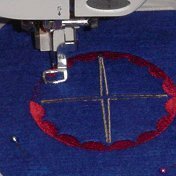 Step 2: Stitch first color of design on hooped felt. 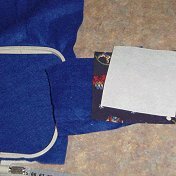 Step 4: Pin stabilizer etc to hooped felt from on top. 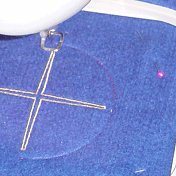 Step 5: Attach hoop to machine and stitch tack down. 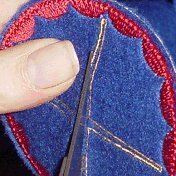 Step 6: Stitch out edge pattern of coaster. 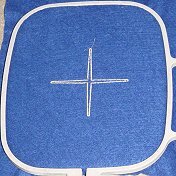 Step 7: Once stitched out remove hoop from machine and cut coaster out. 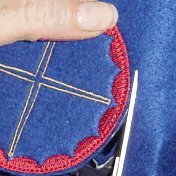 Step 8: Use small sharp scissor and cut top layer of felt open between lines, in a cross. Slip coaster onto foot of glass. 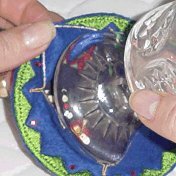 Coasters can be decorated with beads or Swarovski crystals. 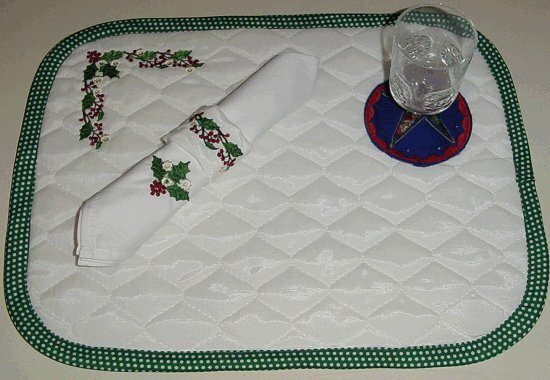 Example of a table setting done with designs from the Christmas 2004 embroidery design collection.